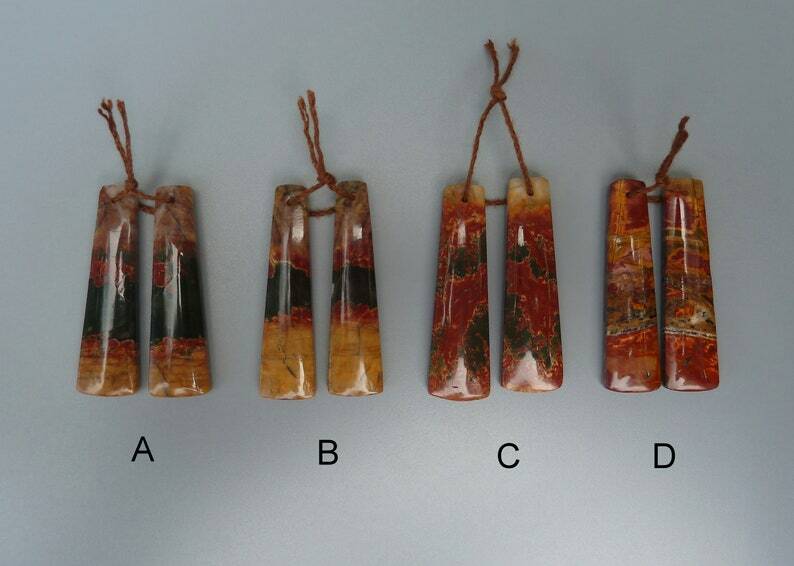 This listing is for one pair of matching Red Creek or Cherry Creek Picasso Jasper rectangular fan shaped drilled cabochons. The colors in these exquisite cabochon gemstones include mustard yellow, brick red, gray, copper, dark green, and brown. The back side of the beads is shown in the third photo. Red Cherry Creek Jasper, also known as Red Creek Jasper or multi-color Picasso Jasper, is a stone from the Red River in China. It exhibits unique color combinations that range from bright red to aqua to dark green or to a mustard yellow. It has amazing brecciated patterns which make it appear like an abstract landscape painting. Colors: mustard yellow, brick red tan, gray, copper, dark green, and brown. Thank you for your interest in my jewelry making products. I appreciate your business! 1. You may pay using Etsy's direct check out process. Direct checkout is a payment method that offers buyers the option to pay by credit card, debit card, or Etsy Gift Card. 2. You may pay using PayPal, where you can pay via your PayPal balance, e-check, or credit card. If you choose to pay via PayPal, just select that option and you will be directed to the PayPal website. Please note that if you live in South Carolina, you will be charged the appropriate sales tax for the state and county. Customers who live outside of SC, will not be charged sales tax but will be responsible for any taxes imposed by their respective state law. If you are a customer who lives in SC and would like to purchase for resale, please send me a copy of your resale certificate and I will be happy to waive the sales tax. If for some reason your purchase does not live up to your expectations, you may return it for a refund of the purchase price not including the original shipping charges. Please contact me within 7 days of receipt for return approval. Returns should be carefully repackaged and mailed to the return address provided. All items returned must be in original condition. Upon safe receipt of your return, I will process your exchange or refund. Return shipping charges will not be refunded. Once payment is made, I will ship your package within 3 business days. Your purchase will be safely wrapped and shipped in a bubble envelope. I typically ship via United States Postal Service First Class Mail but can ship Priority or FedEx if requested. Please e-mail me for the revised shipping cost for alternate methods. Shipping fees vary by item. So please refer to the individual listing for domestic and international shipping fees. If you would like to insure your package, please e-mail me before making your purchase and I will make the necessary adjustment to the listing. International customers are responsible for all customs fees and/or duties associated with their purchase. Regarding lost packages, I ship all domestic packages with a USPS tracking number. Once a package is shipped, I will notify you with the date shipped and the tracking number. I cannot be responsible for packages that are lost where no insurance was purchased. Insurance is at buyers request if not specified in the listing.